Consistent with Saori philosophy and our vision of offering a destination for creative expression through fiber arts, we recognize that each individual is on their own journey and works at their own pace. As such, we offer open studio time instead of topic-specific classes. I see my role as your Saori “guide,” offering suggestions, resources, and materials that will enhance your creative experience. 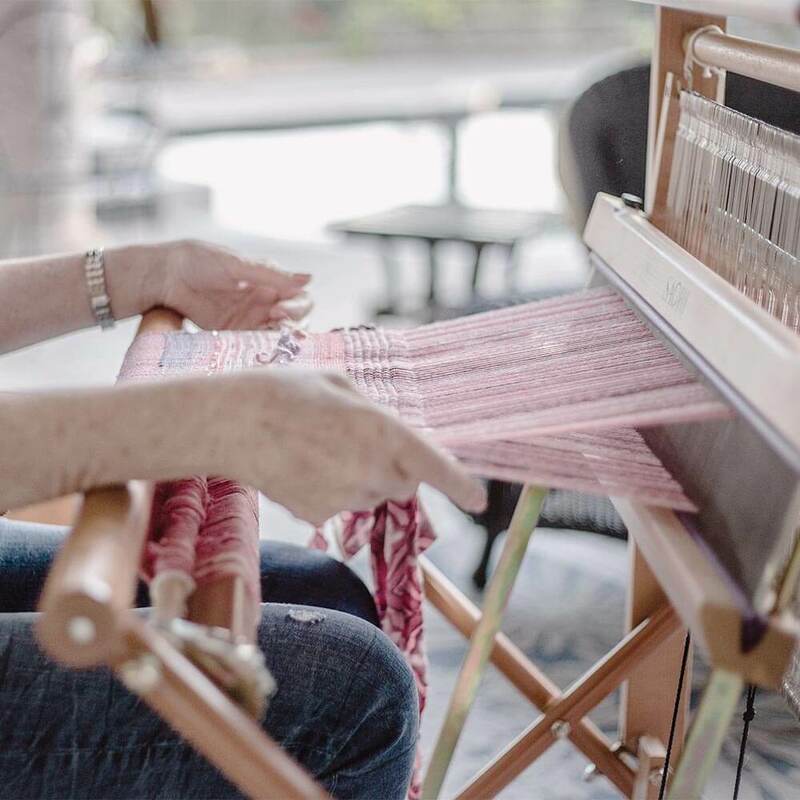 Coming to the studio, connecting with weaving friends, and savoring the time you set aside for yourself and your creative explorations may become the high point of your week! each individual is on their own journey. The studio is a place to become comfortable with the Saori loom, learn weaving techniques, gain inspiration and share ideas, or simply get “into your zone,” independently weaving an on-going piece of unique art. 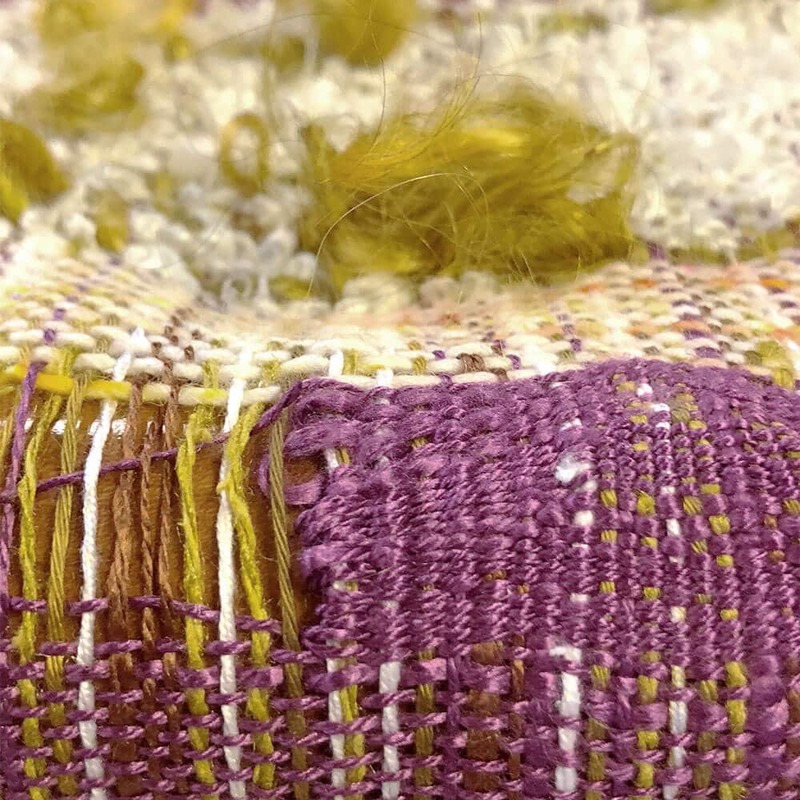 One student may be interested in learning to create their own beautiful warp, while another may be at the sewing machine making a one-of-a-kind garment from their hand-woven cloth. Works in progress can be detached and re-attached from our Saori looms, and we provide storage space for projects between visits. This flexibility allows for multiple students to use a limited number of looms, working on their projects during their scheduled sessions and storing their work between sessions. There are two primary ways to weave in the studio: open studio time, where you can explore and play at your own pace, and instructor-guided mini-workshops. Open studio time is available weekly on Thursdays, and mini-workshops are held regularly on scheduled dates. See the registration form below or the Events Page for the current lineup of mini-workshops scheduled. Registration: For all open studio time and mini-workshops, reservations and payment are required in advance to reserve your spot, unless otherwise stated or other arrangements have been made. Class Fees: Unless otherwise noted, mini-workshop fees include all materials. Open studio time sessions fees do not include the cost of materials, which are generally $4 per ounce and are calculated upon project completion. Cancellation Policy: Cancellations received at least 72 hours prior to workshop are eligible for a full reimbursement of payment. Cancellations with less than a 72-hour notice will receive no reimbursement. Please note: Occasionally the studio will be closed due to our traveling schedule. Please confirm by contacting us in advance to assure that the studio will be open on your desired Thursday. Cost: $35 for each 2½-hour session, plus cost of materials. Please reserve your spot in advance. For your convenience, payment for each session can be made when you arrive at the studio. Book studio time in bundles of 4 classes and save 10%! As with open studio time, studio bundles are offered weekly on Thursdays in 2½-hour blocks: morning and afternoon. Cost: $140 $126, plus cost of materials. Bundles must be purchased in advance, both to reserve a loom / equipment and to receive the discounted rate. Listed below are the current mini-workshop options offered by Wimberley Valley Saori. See the registration form below or the Events Page for the current lineup of mini-workshops scheduled. Unless otherwise noted, mini-workshop fees include all materials. Reservations and payment are required in advance to reserve your spot, unless other arrangements have been made. Please fill out the form below if you wish to register for Open Studio time, Studio Bundles, or Mini-Workshops. I will respond to your request via email, followed by a phone call to collect your payment information and, if applicable, set up specific days/times with you. Select one of the class options below to see additional details and options for that class type. Stay up to date with what's new in the studio — from new classes and mini-workshops being added to the schedule, to upcoming events and festivals we'll be attending, and all sorts of other news! Success! Thank you for adding your name to our mailing list! We promise to never sell or share your contact info with anyone else, and your info will only be used to end you our e-newsletter.